The secret to effective leadership is not in just telling people what to do, but inspiring them to achieve it through your example. You set the tone for the people you lead. They look to you to model the behaviours that build a healthy, effective organization. Your most important leadership tool is not power, achievement, experience or charisma. It’s your example. You set the tone for the people you lead. They look to you to model the behaviours that build a healthy, effective organization. It Starts With Me awakens the self-awareness that leaders need. Whatever you want to achieve, it reminds you that you must first “be” the change you seek in others. Participant workbooks for this FISH! 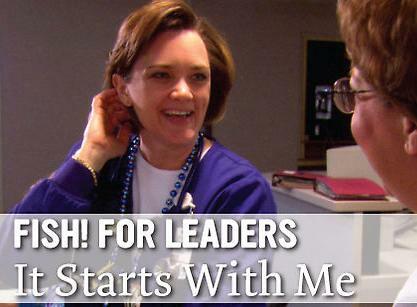 For Leaders program are sold separately at $9.00 each.